I’ve been interning here at Spreadwing farm for about two and a half weeks. Under two more weeks to go and back home it is. One of my daily duties here comprise of caring for chickens, about eighty of them. They are great fun as there are three age groups. 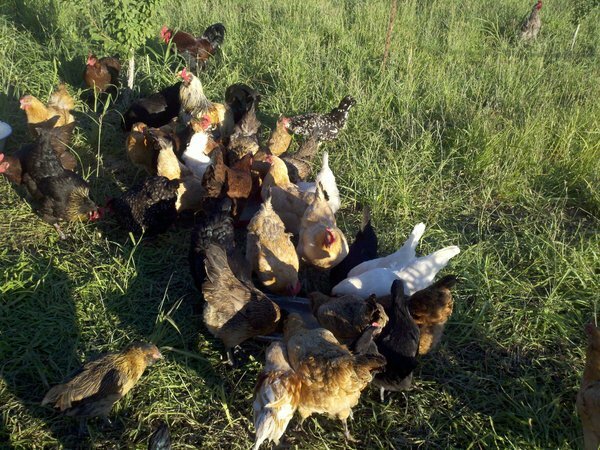 We have the older egg laying hens and two roosters, the pullets (teenagers), and the chicks. This keeps me feeding and watching three different stages in the growth. For example I get to see the chicks develop their roosting habits and start to climb and sleep on roosts. Also I am seeing how the pullets are developing their feather patterns and learning to go into the coop at night. And last but not least, I get the eggs from them every day, about twenty, and hope to catch the egg eating hen. We are loosing about one egg a day due to this rascal.